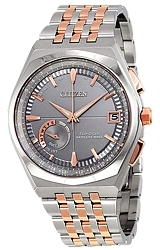 There is a quintessential style shared by most men's dress watches for the last 70 years and Citizen has embraced that design in creating a classic men's watch, but with their amazing Satellite Wave, world time, perpetual calendar technology. Now you can have the finest technology in a clean, crisp designed watch with timeless styling. Features include a stainless steel case with a two-tone (silver and rose gold-tone) case, a matching two-tone stainless steel bracelet, Date display at the 3 o'clock position, Day of the week sub-dial, Eco-Drive (battery free) technology, time set by GPS Satellites and a virtually scratch proof sapphire crystal with water resistance to 100 meters / 330 feet.